The Eddystone User Group is dedicated to all collectors of Eddystone Radio products, most of which were manufactured at the “Old BathTub” in West Heath Birmingham from 1940 until 1995. The history of Eddystone Radio is a long and fascinating one. The company’s origins begin with a badge and fancy goods manufacturer in the early part of the 20th century, saw the start of radio broadcasting in the 1920’s and saw it play a major part in equipping the armed forces with radio communications equipment during the Second World War. After the war the company became associated with another great name in radio, The Marconi Company. After being suppliers to that company for twenty years it was eventually to become a wholly owned subsidiary in 1965. It remained a Marconi company for nearly forty years until Marconi started its serious decline into oblivion under the successors to GEC’s Lord Weinstock. The history of the company can be found on the HISTORY header on the Home page. 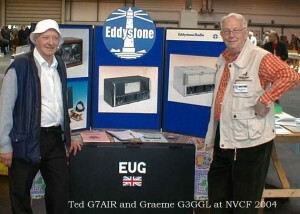 The Eddystone User Group was started by Ted Moore G7AIR (SK = Silent Key i.e. passed away) in 1990, with his wife Kathy and was a membership organisation up until April 2006. During that time it had some 300+ members and some 96 issues of the EUG newsletter were published, plus numerous supplements and technical information about this great company. Between 1996 and 2006, Graeme Wormald G3GGL, (now SK), was EUG administrator and Newsletter Editor. As well as being a major contributor to the magazine, he also produced, the Quick Reference Guide (QRG), which can be found under the TECHNICAL header on the Home page. Ted had been collecting Eddystone receivers for many years and had become acquainted with a dozen or two like-minded individuals. He decided that it would be a good idea to produce a sort of round robin to circulate around the group so as to avoid interminable telephone calls! Thus was formed the E.U.G. with an eight-page newsletter. Ted wrote the newsletter on his portable typewriter and his XYL Kath looked after the copying and the membership list. Contact was made by Ted with the Eddystone Factory at “The Bath Tub”, the old West Heath Lido where Eddystone had settled after being bombed out of the city centre of Birmingham in 1940. The Managing Director, Chris Pettitt, GØEYO, being an active ham and having a sense of history agreed that information could be available to the group from the company’s technical publications section, which had a substantial archive of the many sets produced over the years. 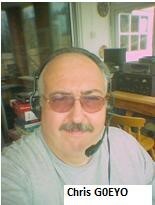 The show was on the road and notices in the radio hobbies’ press produced a steady flow of new members. In the end the group became a victim of its own success. After four years the membership had grown to over 200 and Kath could no longer cope with the increased administration, printing and distribution, as well as doing a full-time job. When Chris Pettitt learned that the Group was in danger of folding he arranged for Eddystone Radio to take over the administration, together with the printing and distribution of the now much enlarged newsletter. His secretary, Pat Hawkins did much of the administration and Christine Surman their Technical Publications assistant did the printing. I don’t think he ever got around to telling his masters at Marconi what he was up to! Things stabilised and the group continued to flourish with Ted still producing the text but on a newly acquired word-processor. After a couple of very successful years, with Graeme Wormald, G3GGL, helping Ted with some of the text, another shadow was cast over the Group. This time it was due to the future of Eddystone Radio in Birmingham. The premises at the Bath Tub actually belonged to Laughtons (who owned Stratton and Company, the original owners of Eddystone). When they sold the radio company to Marconi in 1965 they signed a lease for the Eddystone part of the site for 30 years. This was due to expire in 1995 and Stratton, still an active producer of fancy goods, wanted the site for housing development. This was the dawn of Digital Audio Broadcasting and Eddystone were also keen to move to more presitigous premises which reflected the company’s high tech products. In the event Eddystone acquired industrial and office premises at Selly Oak, a suburb of Birmingham on the Bristol Road about three miles from the Bath Tub. The removal was a major disruption, both to the company and the User Group. Graeme Wormald, still very much a fringe activist in the Group offered his services to help things over the hump. In fact after a couple of years there was a serious downturn in the company’s fortunes. Malaysia and the Far East had been a good market for the Company’s transmitter products and a severe drop in the Malaysian Ringitt resulted in the loss of a large order of FM broadcast transmitters for Malaysia and the slow start of DAB broadcasting, (pioneered by Eddystone and the BBC) meant that orders for fill-in multiplexes were delayed. Marconi were also seriously looking for buyers for Eddystone as they no longer saw broadcasting as a core business. Pressures mounted and after a failed management buyout, Chris eventually resigned as Managing Director in 1998. With that Graeme’s role in the Group, far from being a passing phase, became almost a full-time job. Finally the owners, Marconi-GEC, went down-hill and sold Eddystone Radio to another Company which ended up in administration after another couple of years. Graeme Wormald retired as administrator/editor in 2006 at the age of 75 so it was decided to form a trust to manage the mass of information the EUG had gathered over the years and make it accessible to all in the form of this web site. Since 2006 we have been able to upload over 3Gb of information all of which is freely available to download. Study the drop down menus on the header and the subject boxes on the left hand side of your screen. We have histories, technical information, articles on restoration, newsletters, service manuals, a for-sale and wanted page plus much, much more. The site was originally managed by the same people who previously ran the Eddystone User Group, They formed a not for profit trust which originally comprised; Ted Moore G7AIR, James De La Mare (now SK), Dave Simmons and Chris Pettitt G0EYO. The objective of trust was to ensure that the information and archive material we have gathered over the years is available through this web site is freely available for the benefit of all. The web site is financed by the trust and will rely on donations from grateful users. We hope to keep it free from commercial advertising. If you are an Eddystone enthusiast then we would welcome your donations. Follow the link on the left panel. By 2015, three of the original trust members had passed away and Dave Simmons had moved to the Channel Islands. Therefore three new trustees were appointed and the trust now comprises Chris Pettitt G0EYO, Ian Nutt M0ECQ, Chris Harmer M0HMR and Gerry O’Hara VE7GUH. Together they will ensure that the web site continues to provide free access to information on Eddystone sets.